You may notice our website is looking a little different. We’re excited to announce we are in the process of updating to a new and improved, faster website. The improved site includes changes to navigation, with a better user experience for both mobile and desktop users. We’ve also improved the site structure and search function, so you’ll find things easier. There’s also a host of smaller changes to improve your membership experience online and make the site faster to use (especially eContracts!!). Once the website update is complete, we'll let you know about all the changes and extra features available. For now, here's several important things you need to know. Your username is now the email address listed on your MBA membership record. If you are not sure which email address your membership uses, simply click the link below and we'll tell you what it is. If at anytime you have a problem, send an email to our membership team and we will respond asap. *Please note you only need to do this once the first time you visit this new MBA website. Also, it is okay to reset using your existing password. To access eContracts you must be logged in to the website as a member. eContracts is a member only service. 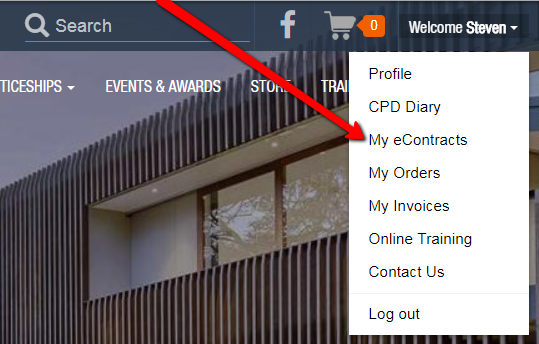 Once you are logged in, click the drop down menu next to your profile name (top right hand corner of the website) and click My eContracts. You can now access your existing eContracts or create new ones.